Understanding that every industry has unique workflow needs, Crest have a new range of customisable MFPs to make your job easier. Intuitive and smartly integrated our products simplify complex tasks and give you control while providing the reliability Toshiba is known for. Toshiba’s high-end A3 colour line-up is as impressive on the outside as it is on the inside. Its ultra-modern look houses the latest innovative technology, like brilliant quality delivered at up to 65 pages per minute in colour as well as at up to 75 pages per minute in monochrome. The Toshiba e-STUDIO 6506AC has a new high-quality 22.9 cm (9″) tablet-style multi-touch screen can be personalised according to a user’s preferences and needs. It starts with the background image, which can easily be exchanged and continues with personalised views. You can change the order of the icons on the home screen, add or remove buttons and decide how many icons should be displayed per page, so that all functions present themselves to you in a way most useful to you. The Toshiba e-STUDIO 6506AC model fulfils the highest security standards to protect your data from unwanted access. So whether you are looking for document security, device security or access security – our new system has it all. The Toshiba e-STUDIO 6506AC series helps workgroups connect, integrate and simplify while improving efficiency, productivity and the professionalism of presentations. Advanced e-BRIDGE Technology enables the MFP to drive Toshiba’s internally developed embedded solutions or those from a third party with ease. High, Robust Speeds 65 brilliant colour pages per minute and 75 monochrome pages per minute. Print Around eliminates printing bottlenecks by allowing other print jobs to go around one job that’s held-up due to requiring a specific paper size, type or, in some cases, colour toner. Toner Change On-The-Fly allows you to replace the toner cartridges while the MFP is printing. Embedded Optical Character Recognition (OCR) simplifies the creation of searchable PDFs or prepares for editable document formats such as Microsoft Word. 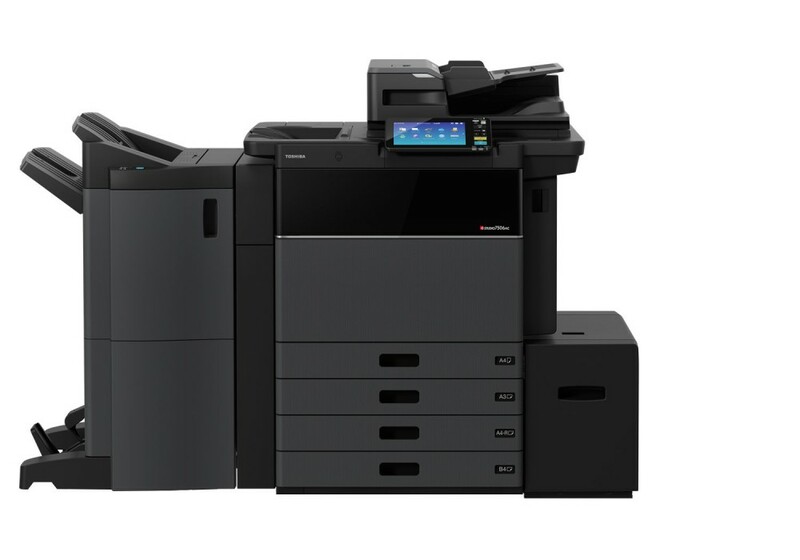 Bluetooth/Wi-Fi Option to simplify workflow processes at the MFP and enable Wi-Fi Direct printing — ideal for mobile users. Card Readers for these models are optional and can even be installed discreetly behind the cover of the systems. They not only give you fast and convenient access to your print jobs but also increases data security.